Metric: Cards. Eyes were used in Court of the Shadow Fey. Plus there's a fine tradition of using cards in an oracular context. DISCLAIMER: Review is based on a PDF copy provided by Open Design. Overall: 5 cards. The introduction gives you a good high-level introduction. 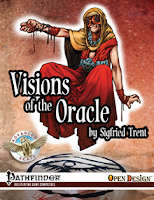 The feats give options to oracles, spellcasters and other characters. The builds are examples of the versatility of the class from visionary healer through fiery phoenix to bloody-handed savage seer. My only caveat is there isn't much oracle-friendly advice for the GM outside of combat and post-combat activities. Given such advice probably deserves another book in itself, it may be for the best. Layout: 5 cards. The cover fits beautifully as Christophe Swal shows a figure sat in mid-air with blood dripping from his hand. Inside is clean layout with calligraphy resembling a blend of Farsi and Sanskrit iconography. Page numbers in the eyes at the bottom of the page was a nice touch. PDF bookmarks and links all work fine. Overview: 5 cards. The comparison of oracle and sorceror has merit. The overview is careful to note that an oracle should take advantage of their armour and weapon selection. Give the oracle a boar spear and they can serve behind a shieldwall, if they have the right mystery they can mix it up more directly The choice of curse and mystery makes an oracle very distinct (like a sorceror's bloodline). While more could be made of this, this is an overview after all. Feats: 5 cards. A plethora of feats for spell users yet only three that are oracle-specific (conditional curse, strange revelation and the DM-optional prophetic dreamer) Non-spellcasters get some action with charmed, divine resistance, magic sense and the fierce savage critical. The wand feats are entertaining and well-done, giving mileage to an underappreciated range of magic items and providing a use for that wand of wonder you picked up three levels ago. Builds: 4 cards. Each of these has plenty of attitude and characterisation. The visionary healer is a potent defensive ally that rivals a cleric in battle utility, the haunted past makes an apposite touch for the troubled healer with a heart of gold. The phoenix is a destructive force of nature laden with attitude that shows the offensive capacity of this class in spades, even their curse ties into the character's harsh nature. Finally the savage seer shows barbarian ethics at work, providing a potent battlefield ally capable of fearsome melee action given a twist by speaking in tongues on the battlefield. All of these builds are eminently playable yet seem to focus on combat rather than providing answers or lore to characters. Though this may be for the best, not everyone would want to play Mother Shipton or Margary Kemp but a gypsy-based build would have been nice to see.